What other nation on earth allows people to do that? It's a great thing about America. We should be celebrating it, I think, and I think the administration should celebrate it as well because it says that we're different. And, if we're going to win the war on terror, we are going to win it through our soft power, we're going to win it through saying to the world that we actually have a better model than you because in your countries you settle these things through force and fiat, and here we settle them through law, we settle them through law. Please note, the above is not an official transcript. For video of the event, please click here [real audio]. A disturbing level of racism continues to permeate every aspect of the prison system, a separate investigation carried out on behalf of Zahid Mubarek's family has shown. The last year has seen a rise of anti-Arab sentiment in the province, the Ontario human rights commissioner says. Chief commissioner Barbara Hall said she is concerned about how so-called "Islamophobia" is impacting Ontario's Arab and Muslim communities, saying recent events around the world and in the province illustrate how tensions can quickly escalate into violent action. She cited a Toronto incident that occurred the day after police arrested 17 people suspected of plotting to bomb several locations in Ontario, in which one of the city's mosques had its windows smashed. "We continue to hear ... from Arab and Muslim communities [about] increasing incidents of discrimination," Hall said when she presented the commission's annual report. Hall also said there is evidence of workplace firings due to ethnicity that indicate a rise in anti-Arab sentiment. The Supreme Court ruled on Thursday that Congress did not take away the Court's authority to rule on the military commissions' validity, and then went ahead to rule that President Bush did not have authority to set up the tribunals at Guantanamo Bay, Cuba, and found the commissions illegal under both military justice law and the Geneva Convention. In addition, the Court concluded that the commissions were not authorized when Congress enacted the post-9/1l resolution authorizing a response to the terrorist attacks, and were not authorized by last year's Detainee Treatment Act. The vote against the commissions and on the Court's jurisdiction was 5-3, with the Chief Justice not taking part. The Court expressly declared that it was not questioning the government's power to hold Salim Ahmed Hamdan "for the duration of active hostilities" to prevent harm to innocent civilians. But, it said, "in undertaking to try Hamdan and subject him to criminal punishment, the Executive is bound to comply with the Rule of Law that prevails in this jurisdiction." A Sikh family found a pornographic drawing on their driveway Saturday morning. Police have classified the incident as a hate crime. Valencia High School students had made fun of Angad Chadha because of his religious headdress. "For us it's more than a prank," said his father Arinder Chadha. "It's a prank meant to make fun of the way we look. It hits us psychologically." It is a question that Muslim women who wear traditional Islamic head coverings often face in the United States. They know that many Americans do not understand such veiling or consider it repressive - not an unexpected reaction in a society in which women spent the better part of a century casting off social restrictions, along with floor-length skirts and corsets. But in her book "The Face Behind the Veil: The Extraordinary Lives of Muslim Women in America" (Citadel Press, 299 pages, $22.95), Missouri-born journalist Donna Gehrke-White found that a growing number of Muslim American women voluntarily wear a head covering - known as a hijab - and find that choice spiritually empowering. She also interviewed women, just as devout, who have never worn veils and say they never will. Gehrke-White, a reporter at the Miami Herald, grew up in St. Joseph, Mo., and is married to Tim White, an editor at the Herald who grew up in St. Louis. They have two sons. Are the Miami Terrorists "Muslims"? A prominent national Islamic civil rights and advocacy group today called on media professionals not to refer to seven terror suspects arrested in Miami as "Muslims." Two British scholars -- Yasmin K. Sekhon and Isabelle Szmigin – have just completed a preliminary study of acculturation amongst second-generation young people in the British Punjabi community. The authors consider the variables that affect the behavior of second generation immigrants, whose parents were born in India but have settled in the UK, and whose cultural background could be described as a mixture of the home and host country. They consider questions such as: How does the mixture of cultural influences affect their behavioral? Also, how do they respond to different contexts and situations? Do their behavioral patterns reflect an ease of switching from one culture to another or do they highlight the stresses and strains these individuals face on a day-to-day basis? The authors say that the second generation cannot be neatly categorized, but falls into different categories dependent on situation, behavior, education, family status, class, and caste. Chaz Singh wanted to make a public statement about his life as a British born Sikh and his fight against prejudice using words and pictures. Chaz Singh is one of the recipients of the BBC Breeze bursaries that has enabled him to develop his ideas about identity in a series of photographic images and poems. A Milpitas mosque vandalized last month suffered further damage and a burglary this month. Milpitas Police Department is classifying the crimes at Masjid Dar Al-Salaam at 90 Dempsey Road as vandalism and burglary, though a Muslim organization believes the incidents should be investigated as hate crimes. The latest incident at the mosque, which is located in a strip mall, took place between midnight and approximately 5 a.m. June 3. Abderrazek Barhoumi and Said Jaziri, the imam at Al-Qods mosque on Belanger St. E., came out of the building about 1 a.m. Saturday. They saw a man walk toward them and lift his sweater to show a knife in his belt. [Pierre] Brabant is alleged to have asked one of the Muslim men if he had a bomb on him, then asked both if they wanted to die as martyrs, the police report said. Saying, "I want to kill you, damn it," Brabant is then alleged to have pulled out the knife and pointed it in their direction. Barhoumi took off on foot, police said, with the assailant close behind. Jaziri got into his car, called 911 and started following the two men. Two police cars arrived on Iberville St., where they arrested and searched Brabant. "He said he didn't do anything but then admitted to asking if the men had explosives," Berube said, reading from the police report. "Once inside the police car, Brabant said, 'You're on the side of the terrorists now.' "
Police found a knife with a 20-centimetre blade wrapped in newspaper on the ground nearby. Outside the courtroom, defence lawyer Daphney Colin brushed off the term "hate crime" when asked about the charges against her client, which include assault, uttering death threats and possession of a weapon. Montreal police called the attack a hate crime when they arrested Brabant on Saturday morning. The 7/7 bombings were not the work of foreign terrorists, [Londonistan author Melanie] Phillips points out, but of men born and raised in the British welfare state. Phillips also argues that due to post-imperial guilt and the general takeover of the country's vital institutions by the left, Britain has lost its sense of self, allowing many Muslims to reject what should otherwise be obvious assumptions in the current debate over what should constitute "Britishness." This may explain why the English flag is hard to find in modern-day Britain. 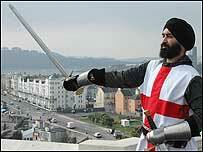 To a large portion of the country's educated, cosmopolitan citizens, the very display of the cross of St. George is immediately associated with right-wing movements and represents a throwback to England's imperial past. As an American living in London at the time of the 7/7 bombings, what most shocked me about the British response was the lack of patriotism expressed by both British leaders and everyday citizens. It was a silence that stood in stark contrast to the patriotic displays that were common in the United States after September 11. Only now with Britain in the World Cup can English flags be seen in abundance [Link]. India: Don’t Torture Sikh Activist Extradited by U.S. The Indian government must ensure that its security officials do not torture or mistreat Sikh separatist Kulvir Singh Barapind, who was extradited to India from the United States on June 17, Human Rights Watch said today. The Indian security forces have a long history of mistreating Sikh activists in custody. What is it really like wearing the Hijab? Does my head look big in this?' tells the story of Amal an Australian Muslim teenage girl growing up in Melbourne, who one day decides out of the blue to wear a hijab to school. Even though Amal a Muslim wears the hijab, underneath it she is still your typical teenager. Not only does she face the dilemma of combating unwanted spots, dealing with silly boys, bitchy class mates and lovesick, weight-obsessed friends. She attracts much unwanted attention by choosing to wear the hijab. If you look and dress like Swarun Singh Bal, [9/11] takes on special significance. Swarun says he is stopped and searched with far greater frequency on trips through the States, but, he says, "I don't blame them. They have a job to do to keep their country secure." For a man who hasn't been past grade three, he can recite Indian and Sikh history as if he had a doctoral degree. A good Sikh, he says, must be disciplined enough to move with the times. So although he knows strict adherence to his religious beliefs, including carrying the ceremonial dagger known as the Kirpan, he leaves it at home when he travels. "If it's snowing out, you have to adapt to the weather. If one cannot carry the Kirpan, one cannot." A group of teenage Christians have been banned by a secondary school from wearing "purity rings" as a symbol of their religious belief in chastity until marriage. At least one of the dozen pupils, who all attend the same girls' comprehensive in Horsham, West Sussex, is considering legal action against the Millais School for "a breach of human rights". Marya Bangee doesn't know what to believe. The UC Irvine sophomore thinks the fact that she's Muslim is the reason she's been singled out for searches at airports and been scrutinized by police at anti-war demonstrations. She's also distrustful of the FBI, uncertain whether the agency is telling the complete story of whether its employees are monitoring Orange County's Muslim community. Her doubts loom a week after Muslim leaders and an FBI senior agent shook hands and patted each other on the back, concluding a meeting that addressed conflicting reports as to whether the community is being watched. Los Angeles FBI Assistant Director Stephen Tidwell adamantly denied that his agents were monitoring Orange County's Muslim community. The Federal Bureau of Investigation (FBI) has launched a pilot programme to reach out to community leaders from the Muslim, Sikh and a few other select communities across nationalities and rope them in in its fight against global terrorism. Called the Community Relations Executive Seminar Training or CREST, the programme aims at three things: bridge the trust gap, develop a bond, and build a level of confidence where the FBI and the community leaders believe in each other to have an honest and lasting friendship. Saba Chughtai and Shakila Ahmad didn't draw the crowds Saturday that anti-war activist Cindy Sheehan did the night before. And they didn't badmouth President Bush or the war in Iraq. But these Muslim mothers brought the same message as Sheehan to the New Thought Unity Center. The Mason women, both leaders in the group Muslim Mothers Against Violence, called upon the 200-plus crowd of mostly women, to see Muslims as people who have more in common with them than differences. Extremist clerics and "AM hate radio" have given Americans a distorted impression of Muslims, Ahmad said. "We abhor violence associated with Islam. Islam stands for peace," she said. "There is no way God wants us to kill innocent people ... That is not what achieving peace as a result of submission to God is." "Hey, where you going, bin Laden?" The whispers gave way to slurs. "Hey, where you going, bin Laden?" one student hollered. "What's that tennis ball doing on your head?" another sniped. Anoop Kochar, who will graduate with honors from Clover Hill High School on Thursday, never flinched. Not to "towel head" or to the curious stares. Instead, he used the incidents as opportunities to educate his classmates about his faith. A new court decision could serve as a wake-up call to company owners and managers who impose dress codes on their workers: When it comes to religion, everything is different. In its recent ruling in Multani v. Commission scolaire Marguerite-Bourgeoys, the Supreme Court of Canada stressed the important role of public education in establishing respect for pluralism. Justice Louise Charron rejected a Quebec school board's ban, supported by the provincial attorney general, which prohibited a Sikh student from taking his kirpan to public school. Unable to accede to the ban, the student enrolled in a private school. The court affirmed a set of conditions designed to meet the board's safety concerns. It rejected other arguments, however, that characterized the kirpan as a violent symbol and said it was an impermissable special privilege to accommodate his religious practice of wearing the dagger-like object. In less than 24 hours, I will be on a plane to India. When I began the journey to make Divided We Fall, I promised myself that I would travel to India once it was done and give myself time to explore and think and write. Nearly five years later, the film is almost complete, and I am about to cross east for my first real break in years. For a moment, I stop my frenzied packing, sit down between books, medicines, and clothes thrown across my bed, and stare at the pink and black hearts on the wallpaper of my childhood bedroom. When I was a little girl, I used to spend hours in this room, writing in my journal, wondering if anyone would ever hear the stories I had to tell. Now I am twenty-five, and if I think back to the past month alone, I have to catch my breath: people are listening – on radio, on television, and on the big screen. National Public Radio’s Crossing East program began broadcasting a segment about my grandfather’s life as an early Sikh American pioneer last month. More than half a million people watched the acclaimed short film American Made when it made its national television premiere on PBS in May. And we just held the final advanced screenings of Divided We Fall at Harvard and Stanford universities. In 1913, Kehar Singh crossed an ocean to arrive on the Pacific shores of California. Nearly one hundred years later, the first public radio series on Asian American history Crossing East tells the story of this early Sikh American pioneer – my grandfather (pictured). The segment takes audio clips directly from Divided We Fall. You can read the transcript and listen online (Segment B). The program is still playing live around the country. You can find your local station and tune in. I remember my father calling me after he heard the program air for the first time. There was excitement in his voice: “I had always wanted Dad’s stories to be told. I had never imagined this was possible.” For the first time, we felt that our history – the history of Sikh Americans and more broadly Asian Americans – were recognized and remembered as part of the making of America, our home. I have seen American Made, the first film by my director Sharat Raju, too many times to count, but nothing could prepare me for the thrill of watching on my own television set. When Edie Falco of the Sopranos introduced the film on PBS’ Independent Lens, I held my breath: this was the first time a fictional story about Sikhs in post-9/11 America was shown on television. In its first week of airings, American Made had more than half a million viewers. We have screened the director’s cut of Divided We Fall at both Harvard and Stanford Universities in the last few weeks – our last advanced screenings before we make our official US premiere this September. Both screenings were special events for me. At Harvard on May 7, we screened Divided We Fall before a packed theater of friends, family, colleagues, crew members, and complete strangers. That morning, the Boston Globe had run an article about our screening in the Entertainment Section (right next to ads for movies like MI III), so the Carpenter Center’s theater was full. The Pluralism Project sponsored the event (thanks to Diana Eck’s invitation and Kathryn Lohre’s hard work) and the Harvard Film Archive hosted us. My academic advisor and director of the Pluralism Project Diana Eck welcomed the audience and introduced Sharat and me. She was gracious and kind, and I thanked her for supporting me in this project for nearly three years now. I then took a deep breathe and introduced the film. Then we sat down. The strange thing about making a movie is that you would think showing it would be the easiest part. After all, all the hard work is over. No performance is necessary: you just have to make sure the projectionist makes the movie play. But screening a new film is hard. The mind races: Will the audience laugh at the funny parts? When will you hear the weight of silence? Will they applaud at the end and will it sound more than polite? When our film was done, the audience not only applauded but slowly began to stand up. I began to realize what was happening: they were giving us a standing ovation. It was a surreal moment and I cherished it. Diana facilitated our discussion with the audience at the end. We fielded all kinds of questions – why did you include the Japanese American internment? what was the most difficult and inspiring parts of making this film? what are the next steps? – and then the very last man who stood up (known as “Brother Blue”) made a request to us: “Please travel with your film as much as possible. Hearing your stories makes such a difference… I commend you.” It was a beautiful ending. The Pluralism Project posted pictures of the event. Stanford University was our next stop. It seemed only appropriate that our last advanced screening was at the university where I began the journey to make this film. On June 3, the director’s cut of our film was the morning feature of the first Bay Area Spinning Wheel Film Festival. When introducing the movie from the stage of Cubberly Auditorium, I looked out to see my thesis advisors in the audience – Linda Hess, Joseph Brown, and Rob Reich. They were also in the audience when I presented my senior honors thesis in June 2003 in a lecture room just next door. Exactly three years later, the student project they mentored has become a feature-length film: a direct result of their care and instruction. I felt lucky to be able to acknowledge them. Laura Selznick, founding director of Stanford's Undergraduate Research Programs, was also in the audience. She was responsible for the grant that put me on the road in the months after 9/11. Sean Fernandes, one of our interviewees in the film, and Sharon Gibson, our story consultant, was also there. My parents Dolly and Judge and my brother Sanjeev were there too. It was a full house: family, friends, and teachers from my college life. The screening was a success and in fact, the entire day turned into one long joyful reunion for me. I am grateful to Mandeep and Parveen Dhillon and to the whole Spinning Wheel family for supporting our film once again. The picture is locked (translate: the editing is done, the story is sealed, now we put it in the hands of professionals to perfect the sound and color). The last thing I had to do was record my voice-over narration in a professional sound studio in Burbank, CA, the DubStage, where movies are made. I had headphones for the music, a big screen for the picture, and a mic for my voice. I was on my feet for eight hours, doing take after take, reciting the words that have now become imprinted in my brain, until we finally completed the film. When I finished, one of the last frames of the movie was still up on the screen: a widow holding her grandchildren. I love this scene. I have seen this movie hundreds of times and although my mind is numb to most of it, there are still some parts that break me - like the ending. Some stories are too powerful to ever become stale. Now I leave in the film in the hands of my trusty team and steal a summer adventure in India. No school, no film, no goals of any kind. I am just going to wander, journal in hand. I cannot remember the last time I did this (maybe when I was eight). I would not be able to take this break without Sharat and our team (especially Jess, Tracy, and Sharon), who will spend the summer preparing for our premiere in the fall. We haven’t made any official announcements about this yet… but check in with us in August! About 40 Muslim high school students bow down to Allah in prayer each day on the stage inside the drama room at Meadowvale Secondary School. In recent years, three of the 17 Canadian terrorist suspects joined in the formal Islamic prayers in between classes at this ethnically diverse school in the heart of a middle-class, multicultural neighborhood west of Toronto. When it comes to clothing and its relationship to religion, a court ruling will make it harder for company owners and managers to impose dress codes on their workers. A ruling by U.S. District Court Judge Roslyn Silver concludes that Alamo Rent A Car violated federal law by refusing to allow a Muslim woman to wear a scarf during the holy month of Ramadan. The judge rejected a series of arguments by Alamo, including contentions that allowing her to wear the scarf, a clear sign of her religion in the wake of the 9/11 terrorist attacks, would cause the business undue hardship. There's a "real danger" of a backlash against Muslim Canadians, says James K. Bartleman, Ontario's lieutenant-governor. In the wake of a string of arrests in Toronto for alleged bomb plots, and vandalism at a local mosque that happened after the arrests were made, Bartleman said we must turn to our Canadian fundamental values — values such as tolerance. A top police chief for Oxford has personally apologised for the way his officers treated a Sikh man after his turban was torn from his head during a racial attack. Rattandeep Singh Ahluwalia was assaulted by two racist thugs in Queen Street in the city centre while up to 40 onlookers stood by and did nothing. Oxford police commander Supt Jim Trotman yesterday admitted: "On this occasion the service we provided fell short of what I expect and could have been better. "Although police were on the scene very quickly, the officers could have done more to treat the victim in a caring manner." Vandals smashed many of the ground floor windows at a Rexdale mosque yesterday, the day after one of the largest terrorism sweeps in the country, leaving some Toronto Muslims concerned for their safety. Prime Minister Stephen Harper moved to diffuse an angry backlash from Muslim Canadians in the wake of the weekend's stunning Toronto terrorism sweep, condemning mosque vandalism and praising Canada's welcoming immigration practices. "German State Bans Hijab-clad Teachers"
Germany’s most populous state, North-Rhine Westphalia, joins seven other states in forbidding teachers in public schools from wearing the Muslim headscarf. Muslim groups have fiercely criticized the bans as compromising their freedom of religious expression. Muslims makes up Germany’s third largest religious community, after Protestants and Catholics.